There are rare times in a foodie’s life when the connection between their stomach and their brain does not work. Times when things are crazy, sad or stressful enough to make a foodie not want to eat. In the past few weeks, I’ve been there. 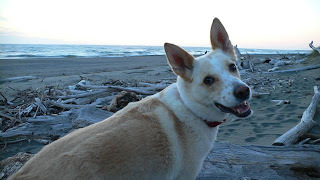 My best friend, sister, and teacher who just happens to have been the softest, smartest dog in the world died rather suddenly. And the sadness filled me up for days. Fortunately, grief really is cured with time, and I’ve started thinking about being in the kitchen again, and bit by bit I am eating again. One of the first things I thought of was soothing, smooth chocolate pot de cremes. If you’ve never had one, think of it as a French pudding, only much silkier and sexier than American pudding from a box. After a few weeks of not cooking at all, something about the feel of my favorite chef’s knife in my hand and the methodical “clunk” of chopping chocolate was better than any therapy. The actual cooking was comforting, a balm my tired heart needed badly. 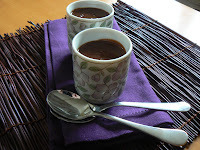 And the cinnamon-tinged chocolate pots? Well, try the recipe yourself and let me know how you feel about them. I know I’ve stopped crying, and that’s pretty good for now, considering the circumstances. 1. Combine the milk, cream, sugar, cinnamon stick, and salt in a heavy bottomed saucepan. Bring to a simmer over medium-high heat, stirring to make sure the milk isn’t burning on the bottom of the pan. Cook until sugar has just dissolved and milk mixture is hot to the touch. Remove from heat and allow mixture to steep for 10 minutes. 2. Chop the chocolate until pieces are no larger than a pea and place in a mixing bowl with a spout. Beat the egg yolks in another bowl. Remove the cinnamon stick from the saucepan and discard. Transfer half of the milk mixture to the bowl with yolks and whisk to combine. Pour mixture back into the saucepan with the remaining milk and cook over medium low heat, stirring with a rubber spatula, until the mixture has thickened and coats the spatula, about 4 minutes. Watch carefully and do not simmer or the mixture will curdle. 3. Pour the contents of the saucepan over the chocolate and let the mixture sit for 5 minutes. Whisk until smooth and pour into 8 four-ounce ramekins. Chill until cool, about 2 hours. Cover tightly with plastic wrap and chill until cold. Serve within 3 days. I’m so sorry — I’ll leave it at that because I’ll cry right along with you. It happens for animals, all the time, that I cry ~ with some people it’s babies, with me…pets. As for the chocolate, what better way to celebrate! I can’t wait to try this! Thank you! !